Founded in 2004 by a select group of former Sotheby’s Europe members, EREN is the product of the coming together of prestigious agents from nine European countries. Together, they represent a collective with an enviable reputation for professionalism, integrity, service and product knowledge. As specialists in luxury real estate, they have created in EREN an international non-profit organisation synonymous with luxury residential real estate. The first of its kind, EREN is a pan-European network of top property professionals who guarantee the highest standards of service and the finest residential real estate across the countries it covers. 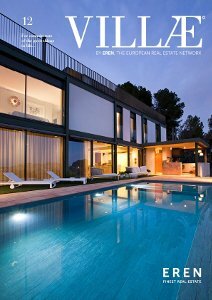 EREN was founded as a means of bringing together the professional skills, international contacts and resources of its prestigious member agencies in order to provide not only a network of highly reputable real estate specialists, but also to establish a platform on a pan-European scale that amplifies the marketing, promotion and sourcing of quality residential real estate. EREN also has its own magazine. You can freely read Villae International Magazine online version. You can also request a complimentary printed copy of Villae International Magazine.